I am disappointed at the decision by Stagecoach Strathtay to withdraw the 72 bus service around part of the West End, although relieved that concerns about the 69 service which covers a larger route in the West End are unfounded and it is not being withdrawn. I was contacted at the end of last week by constituents concerned to learn that the 72 bus, which provides a limited service to Windsor Street 4 times a day on weekdays, was being withdrawn by Stagecoach Strathtay. There had been absolutely no warning about this – indeed a list of proposed bus changes by the bus company had been circulated to councillors last week and the 72 wasn’t even mentioned on it. Residents were particularly concerned that this might mean the future of the 69 service. It follows a similar route to Windsor Street but then continues westwards through parts of the West End to Ninewells Hospital and also serves Broughty Ferry. I immediately contacted the City Council’s Head of Transportation, and am relieved to have been informed that the 69 service is to continue as before. “I have spoken with colleagues and unfortunately the Service 72 was withdrawn from Friday 29 May 2009, which ties in with the withdrawal of operation by Stagecoach of the Services 138 / 139. The 72 utilised a 20 minute gap in service when the buses sat in the bus station between runs. “There was a series of Stagecoach service changes planned for today but these were postponed until the 06 July 2009 changes (as circulated last week). However the cancellation of the 138 / 139 was determined by contract changes with Angus Council, resulting in the knock on that the Service 72 vehicle was no longer available and thus withdrawn too. Given that the 72 service has now been withdrawn, I was surprised to see it was still being advertised on the Stagecoach Strathtay website – I have asked the City Council to point this out to the bus company. BBC, Community Council, local TV and Bus Timetables! Last night (despite the heavy rain!) there was a good attendance at West End Community Council for its monthly meeting and Annual General Meeting. I have now received from Stagecoach Strathtay full bus timetables for the 69 route across the West End (replacement for the old 72) and the “new” 72 route (the reduced route only as far west as Windsor Street) and had these available at the community council meeting. I’m most grateful to the community council member who is ensuring these will be available at both Perth Road Post Office and Blackness Library. If you would like me to send you copies, please e-mail me at bustimetables@frasermacpherson.org.uk – many thanks! On another matter, delighted to see the buses returning to Perth Road east of Sinderins and Nethergate from this morning. I’ve been in touch with Stagecoach Strathtay (following calls from residents) about a hiccup with the 72 service, and the company has responded positively straight away. The bus company to its credit ran an information day in the City Centre on Tuesday about the service/timetable changes from next Monday (see picture – right) – an excellent initiative, and well received by the public. The Lord Provost of Dundee, Cllr John Letford, along with West End City Councillors, Community Council representatives, local businesses, residents and representatives from Scotland Gas Networks, Turriff and Stagecoach, will tomorrow (Friday 15th August at 11.30am at Seabraes Perth Road – just east of Roseangle) mark the official re-opening of Perth Road/Nethergate, which has, since April of this year, suffered a series of road closures, due to gas main replacement works. Dundee City Council Planning & Transport Convener and West End City Councillor, Fraser Macpherson, said he was delighted that the significant disruption to the Perth Road/Nethergate shopping area caused by Scotland Gas Networks’ replacement of the gas main has come to an end, some six weeks ahead of schedule. Cllr Macpherson said, “This has been a very difficult period particularly for local businesses but also with inconvenience to residents, with no or limited through traffic and the bus services having to be diverted. I think everyone appreciates that the gas main work was absolutely necessary but I am pleased it has been finished ahead of schedule and that the Perth Road east of Sinderins and Nethergate west of South Tay Street can return to normal. To mark the re-opening, the Lord Provost will journey on a Stagecoach vintage routemaster bus up Nethergate and Perth Road. Cllr Macpherson said he hoped that, with a diverse range of shops, the district shopping area in Perth Road and Nethergate would remain a highly attractive place to shop. * There will be three full journey routes each day Monday to Friday on the “old” 72 route – now badged as the 69 and including the “old” 69 Broughty Ferry route. * There will be an additional four reduced routes (City Centre to Windsor Street and return) badged as the 72. * The main service buses will return to the Perth Road (Nethergate to Sinderins) from 6am tomorrow following the end of the gas mains replacement works. Dundee City Council Planning and Transport Convener and West End Councillor, Fraser Macpherson, together with the Operations Manager of Stagecoach Strathtay, today met a packed meeting of over 40 West End residents to discuss their issues about local bus services, following concerns about the future of the 72 bus service in the West End area.Cllr Macpherson said this evening that the meeting was an opportunity to explain the new bus arrangements, which start next Monday (18th August) following agreement between the City Council and Stagecoach Strathtay to retain the route, albeit on a different timetable. “The agreement between the City Council and Stagecoach ensures that three full route return journeys per day Monday to Friday will be retained, now badged as the 69 service and now also covering Broughty Ferry. This will ensure that Royal Victoria Hospital, Ninewells Hospital and the Newhall Gardens & Invergowrie Drive areas continue to be covered by the service. Additionally there will be four journeys each day on a reduced West End route as far west as Windsor Street, badged as the 72 service,” said Cllr Macpherson. *Meetings with the Council Leader and the Director of Planning & Transportation about a number of issues. I also spoke at the City Council’s Recess Sub-Committee, backing the report to allow the continuation of a bus service for users of the 72 in the West End and 69 in Broughty Ferry. I am pleased to say the report was unanimously agreed. * I am to be on STV news at 6pm tonight to speak about the latest situation on Post Office closures and my request that City Council legal officers investigate the viability of a legal challenge to the four Dundee Post Office closures. Firstly, after a week of detailed discussions within the City Council, I am pleased to report significant progress towards ensuring the 72 bus service continues. After a meeting with the Chief Executive of the City Council today, I spoke again with the Operations Manager at Stagecoach Strathtay, and thereafter over 50 phone calls to residents who either attended the recent meeting at the Paton’s Lane Sheltered Lounge about the future of the bus service or contacted me about the matter. Over 50 calls took ages (hours to be exact!) but residents are very pleased at the progress. Dundee City Council’s Planning & Transport Convener, Cllr Fraser Macpherson, today announced that, following discussions between the City Council and Stagecoach Strathtay, two vital city bus services – the 69 serving Broughty Ferry and the 72 serving the West End – look set to be retained in a revised format. 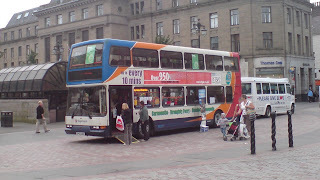 The two bus services had been set to be withdrawn completely from 18th August, following an announcement by the operators Stagecoach Strathtay, but Cllr Macpherson said that, subject to committee approval on 11th August, the City Council had reached agreement with the bus company to retain the routes on a limited timetable. Cllr Macpherson said that both routes provided a lifeline service for many – particularly elderly people – who live in streets that would otherwise not have a bus service. He sais that, as the ward councillor for the West End, he was very aware of the impact of the loss of the 72 service on constituents, many of whom live in sheltered housing and are very reliant upon the service, particularly as the main bus services are a steep climb uphill. Cllr Macpherson added that he was grateful to Cllr Derek Scott from the Ferry Ward for his highlighting similar concerns about the impact of the loss of the 69 service in Broughty Ferry. Cllr Macpherson said, “After a rather frantic week of discussions to try to get a satisfactory solution to this issue, I am pleased that we have a way forward. It will allow a minimum of three return trips each day on both the 69 and 72 services along the existing routes. Stagecoach had already indicated it would be prepared to run a reduced route service along the eastern part of the 72 route and their Operations Manager has confirmed to me that it will proceed with this in addition to the three full-route return journeys per day. “The report to the Recess Sub-Committee will recommend that the Council assists this initially to the end of the current financial year to allow the services to be promoted during that time to encourage greater use and it also gives the City Council time to progress proposals for community transport to assist different communities across the City who do not have easy access to the main bus services. “I am extremely grateful to all my constituents in the West End who highlighted the impact the loss of the 72 service, particularly Friends of Magdalen Green and West End Community Council. The fact that a petition of 526 people was collected in just a few days highlights the strength of feeling on this issue. I am also grateful to Cllr Derek Scott for raising similar concerns about the impact in parts of Broughty Ferry had the 69 service been completely withdrawn. The matter will now be discussed at the City Council’s Recess Sub-Committee on 11th August where a report on the proposals will be tabled. Thereafter, subject to approval, City Council officers and Stagecoach Strathtay will discuss finalised timetables. Cllr Macpherson said that, during a recent packed meeting of West End residents to discuss the future of the 72 service, the Operations Manager of Stagecoach Strathtay had agreed to meet again with residents once matters had progressed and Cllr Macpherson confirmed that he would be arranging this meeting for immediately after the matter has been discussed and hopefully approved at Council Committee. And, talking of the Evening Telegraph, tonight’s paper includes my comments on the result of the Glasgow East by-election (click on headline above to view). A total disaster for Labour and I’d rather not be the Labour MP for Dundee West … The LibDems got horribly squeezed but given past results in similar circumstances (eg Hamilton South) I suppose I should be unsurprised. Ian Robertson, our candidate, performed well (as, in all fairness, did Margaret Curran, but the tide was otherwise). Thank you all for your support and kind words. We fought an excellent campaign in the constiuency where I grew up and which means so much to me. The result was unexpected and not great for the party but the ‘squeeze’ was brutal and there was no more we could have done. An excellent team were behind all our efforts and they deserve huge praise for the positive and impressive campaign we ran. Normality beckons now and a few well earned weeks off before I return to my new electronic smartboard and the great kids of Bellahouston Academy. Feel free to leave this group now and I will dismantle it with a tear in my eye shortly! Today started with a site visit to look at various manhole covers on Perth Road west of the Invercarse Hotel – these have sunk (as the photo – right – shows) and the site visit with a local resident and City Council officials has resulted in various repairs being raised with Scottish Water and British Telecom. Thereafter, I attended the first meeting of the Whitfield Regeneration Board (in my capacity as Planning & Transport Convener). Some hours of “day job” work later, I attended the handing over to Stagecoach Strathtay of a petition of some 526 signatures to help save our 72 bus service. See photo below. 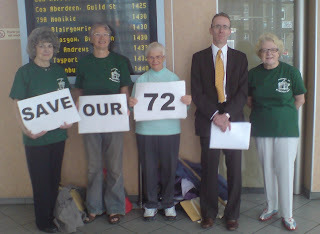 We owe a great debt of gratitude to the local people who organised the petition and collected over 500 signatures in just a few days –it gives a clear impression of the strength of feeling in the West End community that the 72 bus service is a vital lifeline for many – especially elderly – people, and we call on Stagecoach Strathtay to save this vital bus service. The whole community in the West End has pulled together to help the campaign including community groups like West End Community Council and the Friends of Magdalen Green, and I am heartened that so many local people are making their voices heard. Stagecoach Strathtay has agreed to meet with us later this month. The bus company has made clear that it is now prepared to run a more limited service but we don’t think it is acceptable and it wouldn’t cover areas like Newhall Gardens, Royal Victoria Hospital, Ninewells Hospital and Tesco Riverside, and serving these is vital for local people. I think it must be remembered that the 72 bus service currently gives a service to many who otherwise would not have a local bus service and it is the most elderly and vulnerable who would be worst affected if the bus was withdrawn. 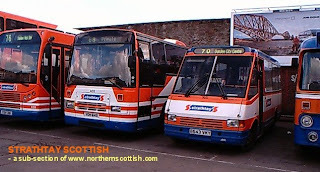 I am hoping that, between now and our meeting with the bus company later in July, Stagecoach Strathtay will decide to agree to keep the 72 on the road. There is no doubt that there is an extremely strong case to keep this service, which is so beneficial to our community. Later this afternoon, I attended the Beacon Management quarterly meeting with Tayside Police, which covers policing issues in the area, and a useful meeting with one of the local housing associations later on which resulted in one constituent’s repairs concerns being addressed.